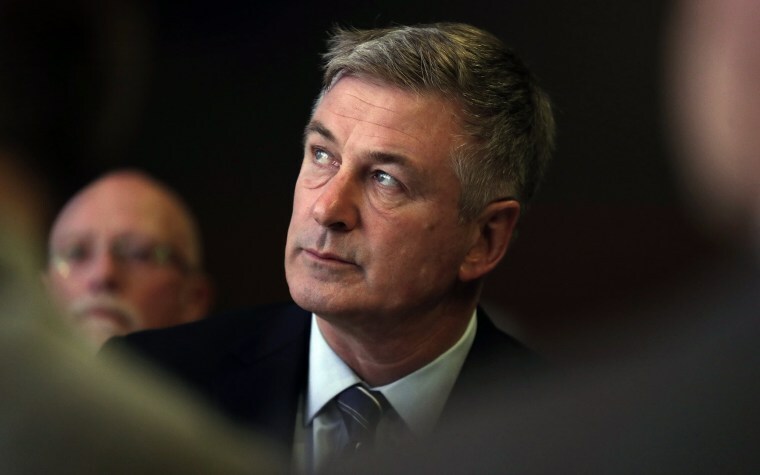 DES MOINES, Iowa — Comedic actor Alec Baldwin delivered a withering takedown of the president he plays on NBC’s "Saturday Night Live," this time on Monday night as the keynote speaker at the Iowa Democratic Party's fall fundraiser. "I still choke down those words every day — President Trump," Baldwin told the sold-out crowd, adding, "I would love to never ever inhabit the brain of Donald Trump again." Baldwin, whose impersonation of President Donald Trump has become must-see TV for political junkies, was at turns funny and stinging in his depiction of the president before 3,000 party activists. While not dressed in SNL costume and makeup, Baldwin went in and out of character as Trump — at one point invoking the day's news to say he wanted to apologize for calling Sen. Elizabeth Warren "Pocahontas." Trump did so earlier Monday at a White House ceremony to honor Native American World War II veterans. "I'm sorry if I offended anyone," Baldwin said in his Trump impersonation. "Especially Pocahontas, who's of course a smoking hot cartoon character." Baldwin was otherwise serious throughout the speech, urging the party to come together in Iowa after the bruising battle between Hillary Clinton and Sen. Bernie Sanders of Vermont in the lead-up to the state's 2016 first-in-the-nation caucuses. Baldwin said that he and other Democrats had been too complacent in 2016 and that a lack of engagement may have cost Hillary Clinton the election. "I only have myself to blame. We didn't work hard enough," Baldwin said, adding, "I make a promise to you: I am ready to fight to help the Democrats win." The fundraiser has been a key launching pad for Democratic presidential candidates in the past. Barack Obama and John Kerry went on to win the state's caucuses in 2008 and in 2004, respectively, after delivering well-received speeches at the event. Democrats eyeing a 2020 presidential bid ceded the spotlight this year to seven Iowa gubernatorial hopefuls. Baldwin at times sounded like a presidential candidate himself, addressing health care, job creation and foreign policy. "A future Democratic president may be in this room tonight," he said. Beth Fouhy is the senior politics editor for NBC News and MSNBC, based in New York.